Moon Tides is dreamy atmospheric pop, swathed in romantic reverb, but what does this predilection towards cavernous sounds say about our current obsessions? 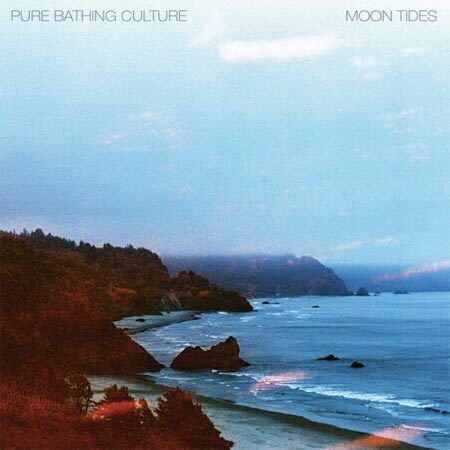 Pure Bathing Culture reflect a number of themes of the indie underground like a crystal ball, that are easily missed or ignored with cursory reductive listening. There’s more going on here. Moon Tides takes steps towards defining the spirit of 2013 — or one manifestation of it, anyway. 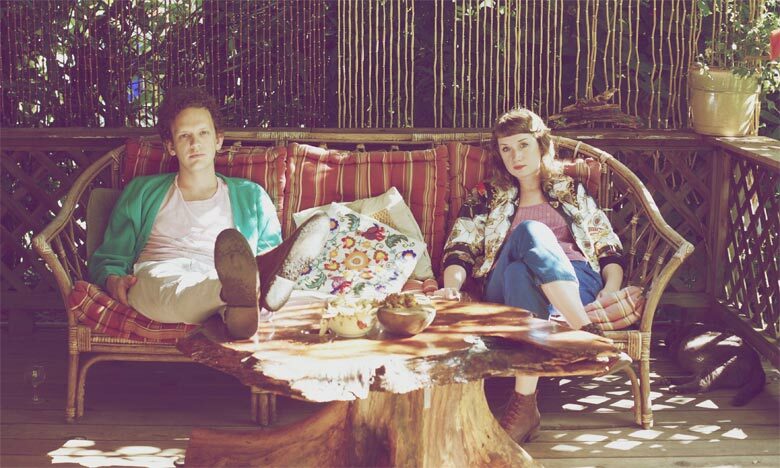 First of all, let’s look at the fact that Daniel Hindman and Sarah Versprille transplanted to Portland, OR from Brooklyn in 2011, after playing together in the retroactive folk rock band Vetiver. This reflects the cultural shift away from industry and big business, as Brooklyn was the place to make it during the 2000s. This westward push shows a growing interest in mysticism, meditation, quiet simple enjoyment of life and of nature. It shows Portland’s increasing role as a cultural mecca, for a particular type of person. No one has named this westward push, and as such, it still has interest and potency. Even though they haven’t been there that long, Pure Bathing Culture are quintessentially Portland, and are a useful lens through which to notice things going on here in the Northwest. They are a gender-balanced duo, which is something you see a lot of here in the City Of Roses. They transubstantiate the mood of ’60s mysticism (Moon Tides features themes about astrology, crystals, tarot cards), and place them in a modern context. You could interpret Pure Bathing Culture departing Vetiver as the culture leaving behind ’70s psych folk wanderings, the freak folk of the 2000s, and stepping into the ’80s. Moon Tides reflects what people like, what people are like, what we all gravitate towards. Pure Bathing Culture’s absorption of ’80s signifiers into the collective shows a tendency towards romance, adventure, and futurism. It is focused on, and excited about, what is possible. It is shooting off into the night. In the actual ’80s, this resulted in widespread capitalism and consumerism; we were going to conquer the future. With Pure Bathing Culture, they cut the decade’s expansiveness with the consciousness of the previous decades, as a way to neutralize some of the dark shadows and hedonism. This record is like revisionist history; they are correcting the sins and mistakes of the past. The joys of Moon Tides are not merely conceptual. The instrumentals are captured in glowing soft focus detail and lovingly arranged; nothing is ever out of place, allowing a mood to settle in and take grip. The languid liquid guitar lines, mingled with simple-but-crisp drum programming, is the real ace in the hole here, and distinguish PBC as an actual musical entity. It’s not entirely perfect, though. Above all, Moon Tides is nostalgic for the entire ’80s, not just the hip underground — and at varying times, it will remind you as much of The Eagles or Olivia Newton John as The Cure or This Mortal Coil. It’s loaded with teenage romance and melodrama, like a John Hughes flick laid to tape, like M83 did a few years ago with Saturday = Youth. It can be a heady saccharine rush that may push some off. The album structure could be criticized as well; it’s top-heavy and all of the best songs are right at the beginning, leaving a lot of the second half to cruise by in an indistinguishable blur. At times, Moon Tides defaults to atmospheric mood music, a pleasant soundtrack for a nice afternoon and little more — and it’s up for you to decide if you like that. Personally, I’m into incidental music, and this makes for a pleasant companion, while doing things around the house or running errands in the sunshine. Pure Bathing Culture are a new band; this is their first full-length, and didn’t have much of a recording budget. The whole thing was finished, in entirety, in 10 days at Richard Swift’s (Foxygen, Damien Jurado, Gardens & Villa) National Freedom studio. They didn’t have time to do a million takes and edits, and because of it, Moon Tides flows with raw unadulterated passion, creativity and inspiration. Bands take note: please stop choking the life out of your recordings in a quantized straight-jacket. Despite pulling from past decades, Moon Tides is actually completely of its time and place, which is nearly impossible to do in this era of interlocking influences. Pure Bathing Culture have placed their finger on the heart of the dreaming and spoken for us all. It is an album that you can return to again and again — the perfect companion for the drooping summer swan song. It makes you feel like you’re swaying on a hammock, or floating on the bottom of a deep pool, watching the lights in anti-gravity. And it is experienced; it has gone through the pastoral fantasies of hippie drop-outs, gone back into the city and done too much coke. Moon Tides manages to come back to innocence, and in that, there is hope. You can listen to Moon Tides, in its entirety, via The Guardian. The record is out now via Partisan Records.